By the time Alex and Shandra returned to the Helix, Alex was starting to get used to the constant flow of measurements her brain was now processing. It still felt extremely weird, but it was no longer disorienting her, at least not as much. “What’s with you?” H asked when the pair rejoined the others on the bridge, seeing the strange expression on Alex’s face. “What do you mean?” H asked, not seeming to grasp the explanation. Alex focused on the cyborg, and was once again bombarded with information. “Like, the distance between the floor and the tip of your hair is exactly 1.805 meters,” she said, picking one of the various measurements she was now aware of at random. Alex gave the mercenary an annoyed glance. “Why would I make this up?” she asked him. “And you just happen to know that number off the top of your head, mate?” Arlon asked incredulously. In rapid succession, H quizzed Alex on the dimensions of each of his augmentations, and every time the girl correctly stated their measurements. What is this even accomplishing? Alex wondered. “H, drop it,” Shandra warned the cyborg. There was an audible thud as Shandra smacked the cyborg on the back of the head, cutting his words short. Alex couldn’t help but snicker. Serves you right, jerkface. “What was that for?” H demanded. “You know what that was for,” Shandra snapped back. “Did he say what his name was?” Shandra asked. “That’s the one,” Minerva answered. The name meant nothing to Alex, but, looking around the room, the others all seemed to recognize it. He must be important. “What did he want?” Shandra asked. Shandra walked up to the console and started the message. The face of a man Alex assumed to be Aarn Hondo appeared on the viewscreen. “Hello, my name is Aarn Hondo. I gave you your warp drive, if you’ll recall. I have been trying to reach you for a while now. Gilgamesh asked me to speak with you. There are important things we must discuss. Meet me at these coordinates.” The message ended, displaying a set of coordinates back in Alliance space. “Agreed,” Shandra concurred. She placed her marked hand on the console and blipped the ship back into warp space. “That’s certainly a compliment,” Shandra said. “Regardless, did he at least die for something?” H asked. “You know where it was,” H corrected him, completely unimpressed. “How do you know it’s still there now?” Dmitri clarified. By the look on Rodriguez’s face, it was quite obvious to Arlon that he had not even considered that possibility. “We didn’t really have any other options,” Rodriguez told cyborg. “Well, you’re useless,” H responded. Arlon saw the cyborg raise his hands, charging up electricity for an attack, and quickly jumped into action. The mercenary stepped in front of H, blocking his shot on Hondo and Rodriguez, then forcibly shoved the cyborg’s arms down. “What the hell are you doing? !” Arlon demanded. “How?” H turned to look at her, eyes still fierce with anger. “Used to be,” H cut him off, his rage growing. Seeing the cyborg cut the charge flowing to his weapons, Arlon released his grip. He turned back to see Rodriguez with his rifle firmly pointed right between H’s eyes. “Is there something you should tell us?” Shandra asked the commander. “I’m sure accomplishing as much as you have has made it incredibly rough,” H grumbled, his sarcasm quite apparent. “So for all we know, his men could be on their way as we speak?” Arlon asked. The Red Suns leader had a feeling he knew where this was going. “I take it you already have some kind of plan?” Arlon asked, a smirk appearing on his face. “So, why not blow it up?” Alex asked. Both Rodriguez and Hondo looked at where Shandra had been standing moments ago, then back to the screen, their expressions looking even more confused. Arlon couldn’t help but chuckle. “That’s one way of... rapid tactical entry,” the commander muttered to himself. “Shandra?” Alex called out in surprise. “What are you doing? !” The girl seemed quite concerned. “A solid plan, luv, but next time, let us know before you make an impulsive decision like that,” Arlon told her. “We have just the thing,” Hondo spoke up. “It’s a little cramped for four people, but you’ll manage.” Hondo stood in front of an escape pod sitting in the station’s hangar. Alex could only guess it was what the smuggler and Rodriguez had used to escape their previous mission, the one Gilgamesh hadn’t come back from. “I’ve flown under worse conditions,” Arlon said as he climbed in. Alex simply shrugged, then followed the mercenary. Once the rest of the Helix crew joined them, Rodriguez closed the hatch. Alex heard a few raps against the side of the pod before it was propelled forward through the hangar shield into the vacuum of space. “We should have left a bomb behind to kill those idiots,” H said as the escape pod drifted toward its target. “What is wrong with you?” Alex asked, even though she knew that there were far too many things wrong with the cyborg to list in the short amount of time it would take to reach the ship. “You obviously have much to learn about how this galaxy works,” Arlon responded. Laser fire flew around the escape pod as it neared the cruiser. The ship was bombarding the station with lasers and missiles in an attempt to disable its weapons. Thanks to Arlon’s adept flying, the pod narrowly avoided a missile just before it reached the hangar. “We’ve landed,” Arlon announced over the comms as the pod ground to a halt. “Closing the door now,” Shandra responded. Once the hangar door sealed, the crew exited the escape pod. Glad to be out of the cramped quarters, Alex stretched out, then gazed around at her surroundings. The area appeared to be devoid of any enemy presence. I guess Shandra’s distraction worked, she thought. Following Arlon’s lead, the Helix crew moved through a series of corridors until they come to an intersection of several hallways. “Hold on, I’m seeing someone with my x-ray vision,” H warned. “Third hallway on the right,” the cyborg answered. “There’s no camera for that hall,” Shandra informed them over the comms. “No need,” H told her. “We’ll just take him down. #1, go!” The cyborg fired a massive blast of electricity at his Rhyhorn, who then proceeded to charge forward, sparks flying off of him as he approached the intersection. A cybernetic man slowly walked around the corner, and the charging Rhyhorn plowed right into him. In one fluid motion, the man slid over the top of the Pokemon, avoiding the brunt of the attack, then landed on his feet, seeming to absorb the electricity in the process. He brushed himself off, then gazed down the corridor at the crew. What? Alex thought in confusion, not at the man’s actions, but his appearance. The resemblance was unmistakable. The sharp blue eyes and spiky blond hair. It was H… but not. “Who the bloody hell are you?” Arlon addressed the man. “So, you must be another of Armstrong’s clones,” Arlon said. “And you must be that traitor Mr. Silver’s been toying with.” I pulled out a Pokeball, and looked at it for a brief moment before returning his focus to the crew. “What the bloody hell are you doing here?” Arlon asked. As the two continued to exchange words, thoughts raced through Alex’s mind. There’s a second H? And he’s evil? We need to stop him. The girl decided that she had heard enough. Someone needed to do something. “No more talking!” she finally shouted. “Lumiera! Inferno!” Alex’s Chandelure floated forward and unleashed a massive surge of flames at the cyborg, completely engulfing him. As the flames roared around him, I simply raised a hand, a glow emanating out from the palm. The flames began to sparkle strangely, then they glitched out of existence. What the hell? “Oh, this?” I asked. Alex was taken aback for a second. It was like he had read her thoughts. But then I turned to look directly at the nearest security camera. He was addressing Shandra; he knew she was there. That thought was terrifying to Alex. “You like it?” I continued. “I picked it up from some residue in Geneva. I believe... you had something to do with that, actually,” he added tauntingly. I tossed his Pokeball out, releasing a heavily augmented Rhyperior. “Now, if you’ll excuse me, I have business to attend to,” he said as he caught the ball. With that, he turned and began walking down the hallway. “Omega, finish them.” The blast doors slid shut behind him, leaving his Pokemon to deal with Arlon and the Helix crew. I’s Rhyperior took a step toward H’s Rhyhorn, firing up its drills as it approached. Gaining momentum, the large Pokemon charged through its pre-evolved form. Luckily, the durable rock Pokemon managed to stand up to the powerful hit. Alex watched H quickly leap to action, pulling out his Pokeball cannon. The cyborg loaded up a pester ball and fired it at Omega, burning the Rhyperior right through its rocky hide and armor plating. As the Rhyperior advanced, Alex locked eyes with it, giving the Pokemon a sad look with a baby-doll expression, causing it to hesitate momentarily. Arlon quickly seized the opportunity the girl provided, and unloaded on the Rhyperior with his pistols. “Wilhelm, Shadow Ball!” Dmitri commanded his Haunter while Arlon had it suppressed. 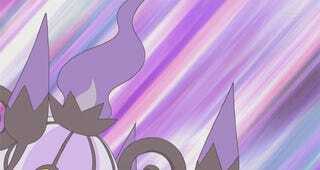 The ghostly Pokemon built up a ball of shadowy energy and lobbed it at Omega, dealing another hit against it. Dmitri then attempted to follow up with an attack of his own, but it failed to connect. “Ironhide, use Iron Tail!” Arlon shouted to his Aggron as he continued his barrage of laser fire. The armored Pokemon charged forward, and swiped at I’s Rhyperior with his powerful tail, dealing a decisive blow. The Pokemon stumbled for a second before regaining its footing. From inside the ship’s network, Shandra monitored her friends’ battle against I’s Rhyperior with bated breath through the security feed while she continued her hunt for whatever data on the Eye of Aether was contained on the ship. Unfortunately, from her current location in the ship’s systems, Shandra could only access the security cameras and mechanical functions. She considered finding a way to jump to whatever servers the data might be stored on, but she didn’t even know where to look for them as Hondo and Rodriguez hadn’t exactly specified what she was looking for. Not to mention the fact that she didn’t want to lose access to the security cameras in case her friends needed help. Turning her attention away from the data stream and back to the security feed, Shandra assessed how the others were doing. Alex had released Leviathan, whose storm clouds were now somewhat obscuring Shandra’s view, but she was still able to see what was going on. She watched as I’s Rhyperior charged right into the middle of everyone and stomped down hard. The feed filled with static for a moment as the whole ship rumbled from the impact. When the static cleared, Shandra got a pretty good view of the corridor, as the shockwave had temporarily dispersed the vapour in the air. Several of the Pokemon looked pretty beat up, including Leviathan, but they all still seemed to be doing a good job at keeping the Rhyperior at bay. Feeling good about her friends’ chances, Shandra shifted her focus back to the data stream. Damn it, there’s nothing here, Shandra thought as she scanned through the information flowing past her. Of course, it was something, just not anything useful. It was all just signals keeping the ship’s systems running. Shandra looked back to the security feed to see Arlon’s Aggron pinning the Rhyperior to the wall. Then, something unexpected happened. I’s Pokemon shoved the Aggron back, then vanished from sight. “It’s got some kind of cloaking device!” she heard H shout. They all began looking around for the Rhyperior, hoping to anticipate where it might reappear. They didn’t need to wait long, as a moment later, the Rhyperior reappeared in the center of the action and unleashed another powerful quake, obscuring Shandra’s view with static once more. The feed cleared up just in time for her to see Arlon slam into a wall and Leviathan collapse to the floor. C’mon, you can do it guys, Shandra thought as she watched Alex recall her fainted Pokemon and send out her Lucario. This was getting a bit rough for her liking, but she had faith in her friends. They continued their barrage of attacks, but the Rhyperior only seemed to be getting pissed off. After Alex’s Lucario landed a powerful Focus Blast on the Rhyperior, the enraged Pokemon set its sights on the Sinai girl. The rocket thrusters on its back flared to life, and it flew through the air directly at her, completely surrounded in flames. No! Thoughts raced through Shandra’s mind. She had to get there; she had to save Alex. “Anubis!” Alex’s scream sounded over the feed. Shandra watched as the girl’s Lucario stepped in front of her, paws held out to counter the charging Rhyperior. Anubis fought through the searing flames and redirected the charging Pokemon’s momentum, hurling it over Alex’s head into the hallway behind her. The Lucario then collapsed into Alex’s arms. Shandra breathed a sigh of relief. Thank God, she thought. She was glad Alex was safe, but was saddened that her Pokemon had been severely hurt. After a brief respite to catch their bearings, during which Shandra began looking for a way to jump to another part of the ship’s network, the team continued onward to the brig. Seeing no dangers along the remainder of their route, Shandra began scanning through the security feeds to locate I, having determined that she couldn’t really access any other systems at the moment. Where did he go? she asked herself, not finding him anywhere. She didn’t have to wait long for an answer to her question; from her position in the network, Shandra was suddenly notified of an escape pod launch. “I seems to have abandoned ship,” she relayed to the others. Privately, she cursed herself for not keeping an eye on the cyborg. Shandra brought up a security feed of the brig to see her friends stepping through the door. With Arlon in front, they approached a cell across the room. Not being able to see the interior of the cell, Shandra changed her view to a different camera. From this new angle, Shandra saw a young woman imprisoned behind an energy shield. She was sitting on the floor, seeming extremely bored. She looked up at Arlon, Alex, Dmitri, and H as they approached, but said nothing. I wonder if she’s Hondo’s missing operative, Shandra thought as she observed the scene. One way to find out. She captured the image on the security feed and transmitted it to the smuggler back on the station. “Hondo, is this who you’re looking for?” Shandra asked over the channel with the station she had kept open. I guess that’s a yes. “That’s who we’re looking for,” Shandra relayed to her friends. Over the security feed, Shandra watched H step forward. It was hard to tell from the particular camera angle, but for a brief moment Shandra thought she saw a confused look appear on the young woman’s face. “Do you happen to know two fools by the name of Aarn Hondo and Samuel Rodriguez?” the cyborg asked. “Yes,” the young woman responded. As the mercenary spoke, Shandra’s view went fuzzy for a moment as the ship was struck with a salvo from the station’s heavy cannons. “Well, clearly he’s not the same individual,” the girl commented as she stepped out of the cell, noting H’s distinct augmentations. “Superior being,” H corrected her. “And I am Experiment #1749XQR5Z-H,” H interrupted the mercenary. “We just call him H,” Dmitri added. “We still need to get that information we came here for,” Alex told the young woman. “Hondo, you there?” Shandra asked over the channel with the station. “Got it.” Shandra relayed the information to her friends, who in turn relayed it to Meta. “Then we want the communications center,” Meta said, scanning her Pokedex. “And where’s that?” Alex asked. With a sense of urgency, the infiltration team followed Meta through several long, empty corridors toward the communications center. Where the hell is everybody? Alex wondered as they pressed on, noticing the distinct lack of crew. For a ship of this size, it was surprisingly empty. Something about that gave Alex the creeps. Or maybe it was just because of I. One H is bad enough… Hopefully evil H can’t control normal H somehow. Alex shuddered, but she remained focused. There were more important things to worry about at the moment. “Damn, she’s good,” Shandra’s voice sounded over the comms a few moments later. “Hey, don’t get any ideas,” Alex replied. “Alright, that should do it,” Meta said, slipping her Pokedex back into her pocket. A few moments later, the team arrived back in the hangar.“Well this’ll be fun,” Arlon commented as they approached the escape pod. He then climbed in and began getting ready for takeoff. “I don’t think we’re all going to fit in here,” Meta observed, peering into the confined cabin. “Nonsense!” H declared. He magnetized himself to the ceiling of the pod, freeing up space for the others. Alex followed the cyborg aboard, then looked around for a suitable space to squish herself into. Being quite flexible, the girl was able to contort herself to fit in a tight corner. It wasn’t the most comfortable position, but she didn’t really have a choice. At least we won’t be in here long. “See, there is plenty of room!” H declared from his spot on the ceiling. Meta sighed, then climbed aboard with Dmitri just behind. The two crammed themselves into the remaining space while Arlon fired up the engines. From her contorted position, Alex was able to see the hangar doors slide open through the viewport. Laser fire still flew as the ship bombarded the now-defenseless station, but Arlon was able to navigate the small pod out of harm’s way. “Someone’s leg is in my face,” Meta commented as the pod continued to drift away from the battle, her voice somewhat muffled. Alex could feel her rubbing up against the side of her shin. “Well, your face is in my leg,” the girl retorted. “Hey,” Alex responded as Helix swept in, allowing Arlon to fly the pod into the cargo bay. Author’s Notes: It’s been a long time since I’ve finished anything, so it’s nice to finally get this posted! 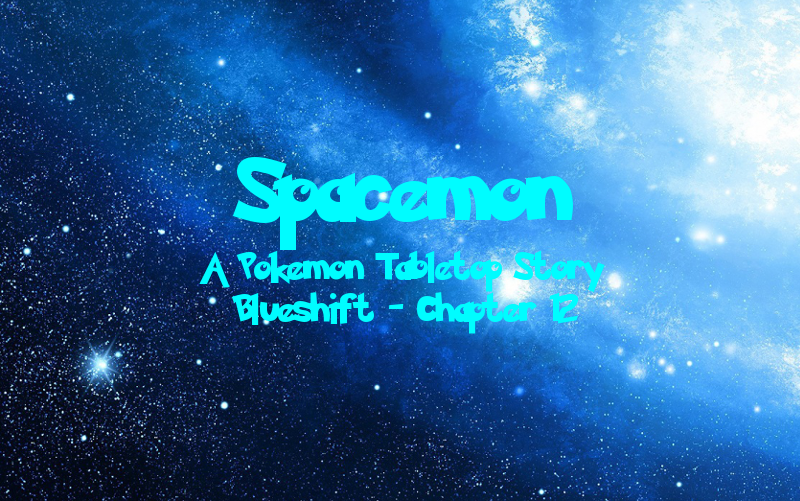 I actually started work on it just after the last Blueshift chapter, writing that opening scene, but then work on it stagnated. The opening bit is pretty straightforward, just resolving the end of the previous chapter, but it isn’t that different from the original aside from Arlon being there instead of Morgan and a few minor detail changes. Where I got stuck was in the next scene since I really wasn’t sure how to handle the interaction without Morgan being there. Having her yell at Hondo and Rodriguez was a great way to open the scene in the original, but that wasn’t an option here. Eventually, I figured something out and it all came together. Overall, the scene wasn’t that different aside from a few key detail changes. The same can be said for basically the entirety of the chapter. The contents are still very important to the flow of the story as a whole so they needed to be here. Given that it wasn’t going to deviate much, I took the opportunity to play around with different character perspectives and worked on writing things a bit more clearly to make it all float better. The scene where I (the character, not me) showed up in particular flowed a lot better not being artificially split between Chapter 3 and Chapter 4 of Volume 3 due to the unfortunate timing of needing to end a session early. It was also fun to toy around with different battle descriptions by showing half the fight from Shandra’s perspective via security feed. Additionally, after I had finished the bulk of the writing I realized that I needed to account for everything being pushed back a week later by Morgan’s death. Since before now Hondo and Rodriguez’s story had been independent of Shandra’s all the changes caused by the gender change hadn’t affected it. That meant that I’s ship still would have attacked the station already. The easy fix there was to just leave a few subtle hints that it was actually a different station and they’d just been on the run for an extra week. From here, though, the deviation is gonna start happening with basically every chapter.